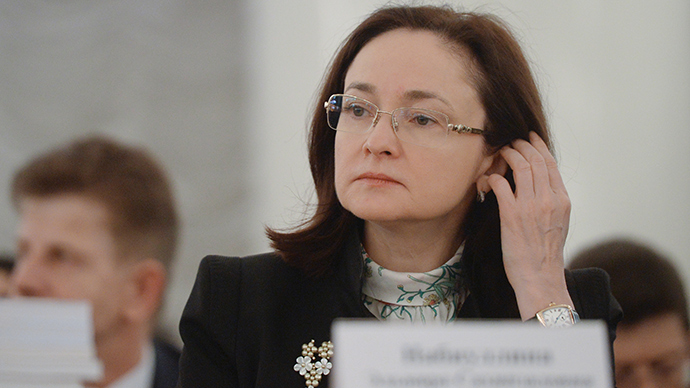 The ruble’s growth may give Russia the possibility to cut interest rates – unless there are major shocks to the economy – Central Bank of Russia (CBR) Governor Elvira Nabiullina said in Washington. The currency’s strength helps slow inflation, and “that’s why with other things being equal and no new significant negative factors, the ruble’s strengthening will allow us to cut the key rate,” Nabiullina said. “The ruble is in a more or less balanced situation. Nevertheless, this balance is dynamic, as it depends on how the economic situation and the balance of payments develop,” the bank governor added. The Russian currency has gained 13 percent against the US dollar in 2015, and experts have acknowledged that the ruble has become the best performing currency this year. Last year, it was declared the world’s second worst performer after the Ukrainian hryvnia. Over 2014, interest rates were raised six times to slow down the ruble decline, which plunged by 48 percent. The Russian Central Bank cut the interest rate to 14 percent in March, and Nabiullina has previously said rates may be lowered further. “When the rate goes down, a niche for import substitution appears, exporters win, but the companies, which need foreign equipment, are in trouble. The strengthening of the ruble gives a positive impact by lowering inflation,” Nabiullina concluded. Last month inflation reached 16.9 percent, but the CBR head maintained that it will go down to 4 percent by 2016. Nabiullina spoke at the IMF meeting in Washington, where top financial officials and central bankers across the globe are gathering this week. The next CBR meeting is scheduled for the end of April.